A new generation of partners are stepping up to carry forward George Smith Partners’ history of collaborative leadership, co-ownership and client-first ideology. 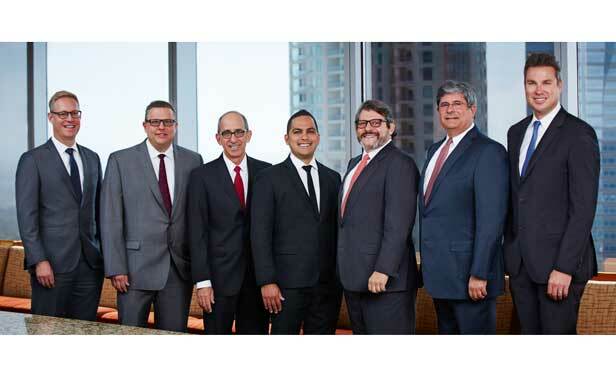 George Smith Partners’ leadership team includes (from left) Jonathan Lee, principal and managing partner; Bryan Shaffer, principal and managing director; Steve Bram, principal and co-founder; Shahin Yazdi, principal and managing director; Gary E. Mozer, principal and co-founder; Gary M. Tenzer, principal and co-founder and Malcolm Davies, principal and managing partner. Not pictured: Antonia Hachem, principal. Since its inception, George Smith Partners has been focused on building a co-ownership and collaborative leadership model. This thoughtful approach has not only secured the firm’s own success in the finance industry but has also helped to shape the industry as we know it today.